4 Bedroom Detached House For Sale in Sheffield for Guide Price £250,000. 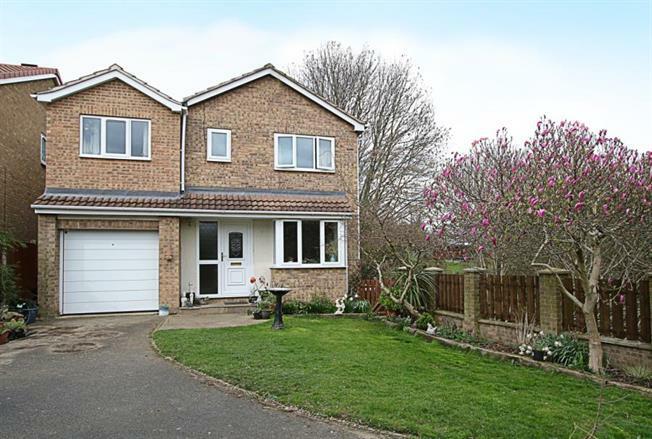 Offered for sale is this effectively extended Four bedroom detached family home situated on an enviable corner plot providing larger than average driveway, integral garage and gardens to the front and rear. Well-proportioned throughout benefitting from accommodation over both floors boasting two reception rooms, en suite facility and family bathroom offering the ideal opportunity to create a fantastic family home to a buyer's own personal tastes and requirements. The property occupies a sought after cul-de-sac location in this popular area of Killamarsh within easy reach of local schools, amenities, public transport links and the M1 motorway network. In brief the accommodation comprises: to the ground floor an Entrance Hallway with ground floor wc and stairs rising to the first floor landing, in turn giving access to the Dining Room and further Living room with feature fireplace. The Living Room gives access to the rear garden via French style doors. A breakfast kitchen has a range of wall and base units with gas cooker point, space and plumbing for an automatic washing machine and laminate to the floor. To the first floor there is a Master Bedroom with En-Suite shower room, three further Bedrooms and a Family Bathroom. Externally: The property has gated access leading to front driveway providing off street parking for several vehicles, accessing the integral garage, along with a lawned garden area. A gate gives access to the rear where there is an enclosed rear lawned and well stocked garden with generous block paved patio/sitting area.